DALLAS – April. 17, 2018 – The standard of care for kidney cancer patients continues to improve. The U.S. Food and Drug Administration granted approval to the combination of two immunotherapy drugs, ipilimumab and nivolumab, for the treatment of metastatic kidney cancer. The Simmons Comprehensive Cancer Center, the only National Cancer Institute-designated Comprehensive Cancer Center in North Texas and one of just 49 NCI-designated Comprehensive Cancer Centers in the nation, includes 13 major cancer care programs. In addition, the Center's education and training programs support and develop the next generation of cancer researchers and clinicians. 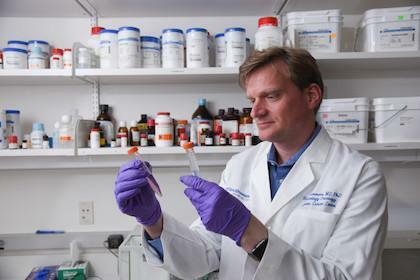 Simmons Cancer Center is among only 30 U.S. cancer research centers to be designated by the NCI as a National Clinical Trials Network Lead Academic Participating Site. Dr. Hammers is the inaugural Eugene P. Frenkel, M.D. Scholar in Clinical Medicine and a paid consultant for Bristol-Myers Squibb. Dr. Brugarolas holds the Sherry Wigley Crow Cancer Research Endowed Chair in Honor of Robert Lewis Kirby, M.D. and is a Virginia Murchison Linthicum Endowed Scholar. Dr. Beutler, Director of the Center for the Genetics of Host Defense, holds the Raymond and Ellen Willie Distinguished Chair in Cancer Research, in Honor of Laverne and Raymond Willie, Sr.